Just like you should never join a gym in January, you should never go flying (or gift shopping) in December - it's just too expensive and the airports are too crowded. Today we surveyed flights from Cape Town to Durban and average flight prices were the most expensive we have surveyed all year. Substituting your December travel time for January is not a bad idea at all. It seems odd to us that an airline can be offering flight specials at the same time as having their flights sold out - for a profit-orientated airline, this would be the time to be charging higher flight prices and cashing in profits rather than offering flight specials. Nevertheless, we had the ad on the right of this text emailed to us on the 22nd November. 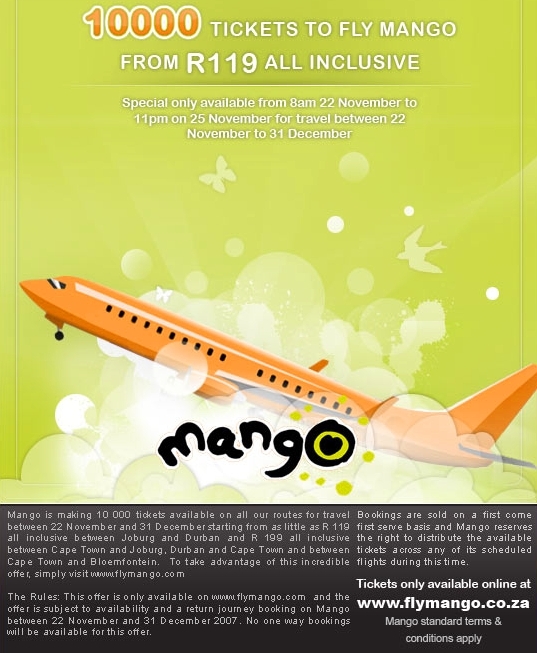 Unlike the last time we received a Mango ad we didn't distribute it to all our readers, as we were a bit dissapointed with what had happened last time (a large number of readers were first elated at the prospect of cheap flights and then disgruntled that they couldn't find any). Without even distributed the ad, one of our readers wrote and complained about it: "10000 Ticket special: ANOTHER SCAM! I would love to see where these seats were offered!? on only 5 flights!? Why then advertise the flights as being available between certain dates, if there is (sic) only 3 possable days to travel. 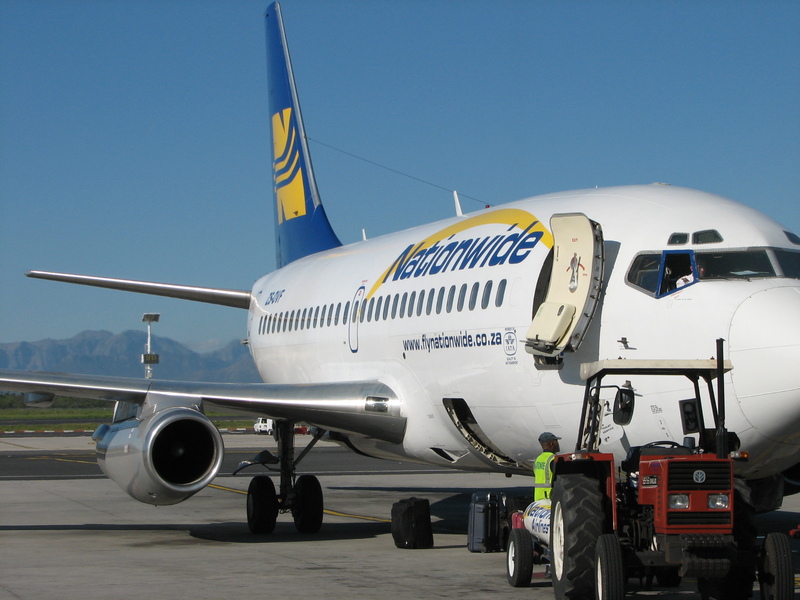 (JHB - Capetown - JHB) Or was (sic) all 10000 seats only available between (JHB - Bloemfontein), because everyone want to go to Bloem for the December holidays!". 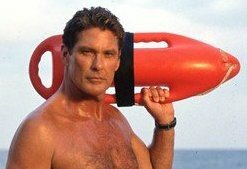 South Africa's Civil Aviation Authority want cabin crew to be able to morph into Clifton beach lifeguards, should a plane crash in water - are they smoking or is this a sensible requirement? We know that Comair will be flying from Johannesburg to London, but with Kulula.com or British Airways? Now, in another surprise Comair have indicated that they will probably be flying from Lanseria Airport, not OR Tambo International Airport: "We’re looking at Lanseria as an alternative to Ortia (OR Tambo International Airport) , but haven’t yet come to a decision. 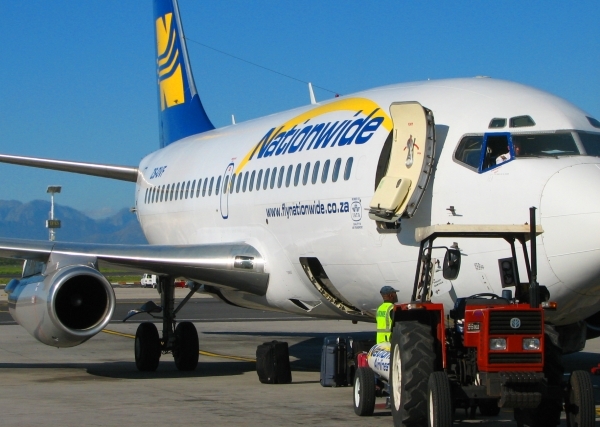 ", Gidon Novick (joint MD of Comair) told Travel News Weekly. Currently, Comair only operates flights from Lanseria Airport with Kulula airline (not British Airways flights). Novick has indicated that the destination will be London, but not London Heathrow; "It's just impossible to get into Heathrow right now." Our guess - it'll be Kulula airline operating cheap flights from London Stansted (outside possibility of London Luton) to Lanseria Airport. 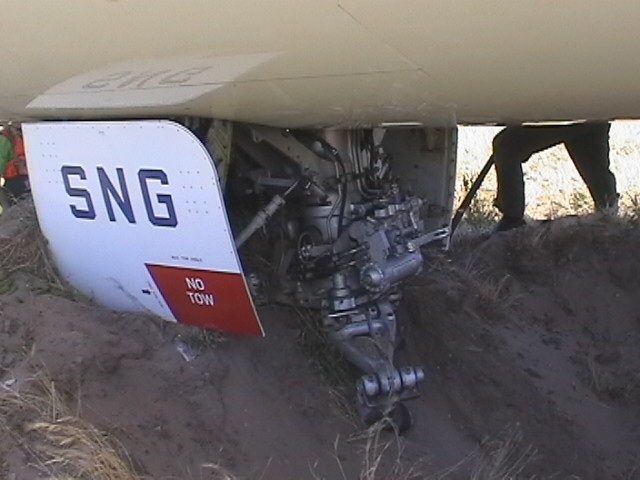 Remember SA333, the South African Airways flight which got its nosewheel stuck in the sand at Cape Town International Airport (FACT) after its pilot executed a handbrake-turn. We flew on SA333, a flight from Johannesburg to Cape Town in the Airbus A340-600, and reviewed the flight. In short, SAA's seating sux (they didn't place Mommy, Daddy and Baby together) but their meals have improved. In light of these experiences, we also updated our British Airways vs SAA comparison (comparison of South Africa's two full service airlines). 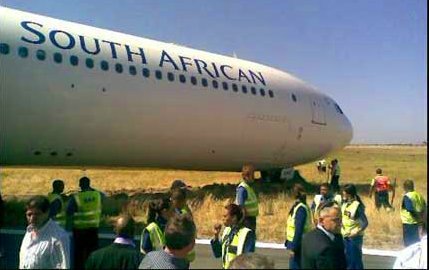 We have had a confirmation that the pilot of the SAA flight SAA333, which got stuck in the soft sand at Cape Town airport was female and indications are that ACSA's had less of a role to play in the incident than was previously thought. This is getting boring and predictable - for the third week in a row British Airways are offering the cheapest flights from Londo to Paris. "We were disappointed that the Irish government permitted the Dublin airport monopoly to increase costs for all airlines from 1 January, and this has already resulted in the average cost of air travel to and from Ireland rising for the first time since 1986. The Irish government has got it wrong. The days of protecting these state-owned monopolies are gone. Dublin airport will once again lose out as all our new routes this year will operate between the UK and Europe." Extract from Alan Ruddock's book, "A Life in Full Flight: The story of the man who made Ryanair take off".